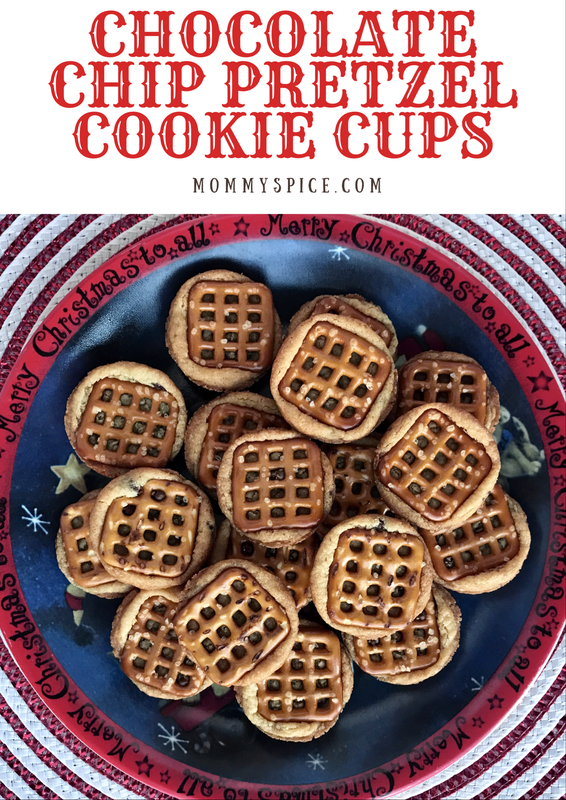 It’s no surprise I am a lover of the sweet and salty dessert, so these cookie cups are right up my alley. Also the crunch of the pretzel not only brings some salt but also adds good texture. And for what it’s worth, according to my kids’ bus driver these were his favorite of all the cookie cups he got earlier this week. Preheat your oven to 350 degrees. Very generously spray your muffin tin with non-stick spray. 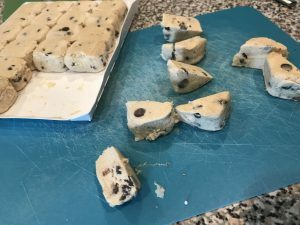 Unwrap your cookie dough and cut each cookie into two even chunks. Roll each chunk of cookie dough into a ball using the palms of your hands. 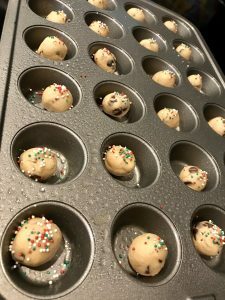 Drop a cookie dough ball in each mini muffin slot. Bake for 9 minutes. Once the cookies come out of the oven you have to move FAST. Place your baked cookies on the stove top and quickly press one pretzel into the center of each cookie. This will create your “cup”. As you gently press down on the pretzel the cookie will form around the sides of the pretzel giving it the appearance of the pretzel sitting inside a cookie cup. Move your cookies to a safe place to set, a dish towel or pot holders on the counter top will do. 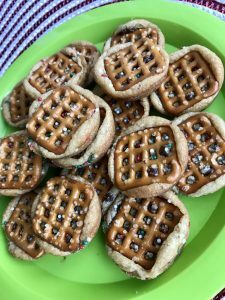 You want the cookies to have a chance to set before you try to take them out of the muffin tin. 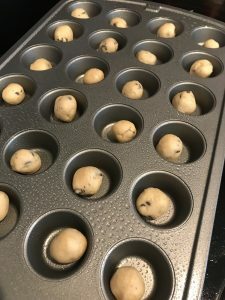 Let the cookies cool at least 10 minutes in the muffin tin. Then move them to a cookie rack to cool or if you’re short on time, or just anxious to eat, place them in the fridge to set up faster. Store in an air tight container and enjoy within a week. Admittedly these look the least like Christmas cookies, but they more than make up for that in flavor. However, I tried a batch with some red and green sprinkles, and it added some nice color, but isn’t necessary. If you’re wanting to add some holiday color, put a few sprinkles on each cookie before you bake them. 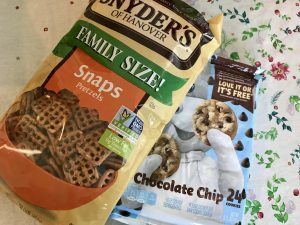 Also regular mini pretzels will work, if you can’t find the square snaps pretzels. 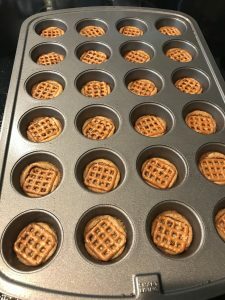 The method is the same as my peanut butter cookie cups, and you should be able to find all the different flavor’s of cookie dough in the same part of the grocery store.